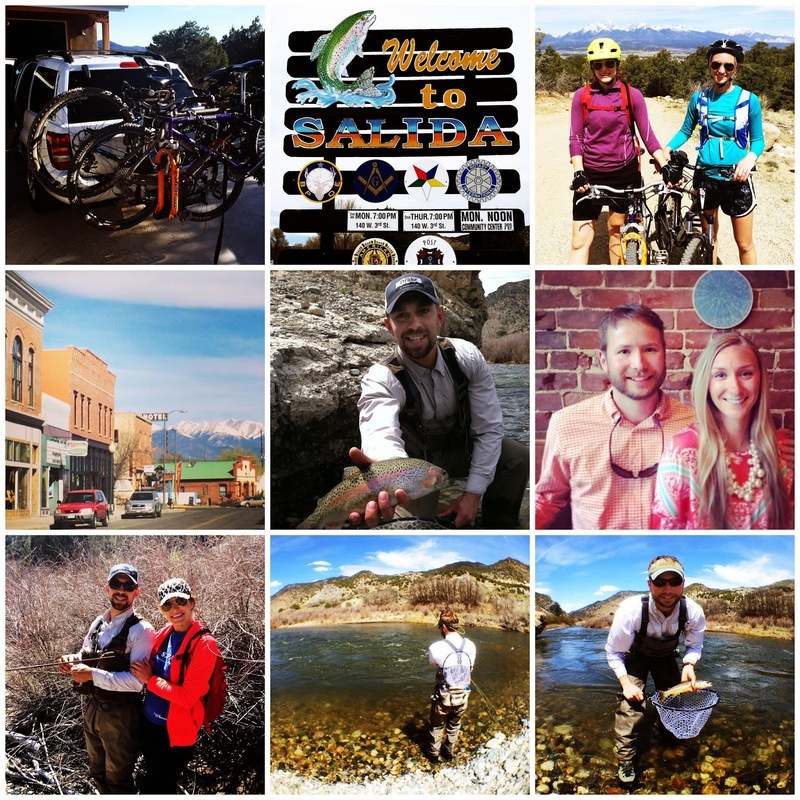 Lisa loves John: A weekend in Salida, Colorado! ONE | Friday after work John and I headed over to our friends Jared and Faerl's home to pack up and leave for Salida. We all (especially the boys) had been looking forward to the trip for awhile. TWO | Normally the drive to Salida is about 5 hours, but there was terrible, terrible traffic going through Santa Fe and we didn't end up making it to town until after 1 am. We rented a vacation home for the weekend and it was the most charming thing ever. I wish I would have taken some pictures, but it was pretty much the most perfectly decorated cabin/lodge home ever. THREE | Saturday morning, we decided that we were going to go for a "casual" mountain bike ride. I was pretty nervous the whole time leading up to the ride because I was worried about getting in over my head. The ride started off with a pretty brutal 5 miles up hill, but once we got to the top, it was a super fun ride down - about 13 miles total. The views of the mountains were absolutely amazing!! Look at the mountains in the background of that picture - incredible! FOUR | After our bike ride, the boys headed out directly to go fly fishing on the Arkansas River while Faerl and I stuck around town and did some shopping. The town was so lovely! Lots of fun consignment stores, home decor stores, bakeries, etc. And of course the city had such beautiful mountain views. FIVE | While Faerl and I were shopping, John and Jared were out catching trout. The weather the whole weekend couldn't have been better (minus some pesky wind). SIX | After fishing the boys headed back and we went to dinner at The Fritz. John was particularly excited about eating there because their logo was a pointing German Shorthair... I, on the other hand, was looking forward to some yummy tapas plates and a cocktail! We accomplished so much on Saturday that it was a very well deserved tasty meal! SEVEN | On Sunday, we went to breakfast, packed up our things, and headed back out on the Arkansas to do a little more fishing. It was fun to watch John and Jared fish, and to be honest, I have only seen John fish a handful of times. When he fished he goes out for a full day, so I don't normally join him. NINE | It was a pretty windy weekend, but they both ended up landing some nice looking rainbow and brown trout. Fun weekend, I loved all of your pictures on IG - the views were amazing! Looks like such a fabulous weekend!! so much fun! I love that y'all collected driftwood for pinterest projects! Cannot wait to see what you do with it! Looks like a perfect outdoorsy weekend!! wow - this looks like so much fun! i love all the pictures. god, those mountains look amazing! Looks like you had a great weekend! How fun and beautiful! Yay for the driftwood! Sounds like such a fun weekend. I love renting cabins for fun little getaways! fun! I still owe you an email.....#fail. ahhh what a fun weekend! i love your pics. seriously jealous of this weekend!!! it looks so amazing! girl, you rock! That bike ride sounds pretty amazing! What a fun trip! Happy Monday! Love CO! So jealous but oh so glad y'all had so much fun!!!! SO fun! Looks like you guys had a great trip! There is nothing like a good weekend away with lots of outdoor adventures! What gorgeous pictures! Looks like a great weekend getaway! Happy Monday, Lisa! I love Colorado so much!!!! I don't think I've ever been to Salida though... Beautiful pictures and looks like a great time! What an amazing weekend! Sounds like a great time! Love all the pictures!! So beautiful! Sounds like a great weekend! Love that you had pinterest on the brain! :) That would totally be me too! Looks like you guys had an awesome time, what a beautiful place!